Tedder & Sons Masonry is a family owned business that has been in operation since 1968. Owner Frankie Tedder took over the business from his father Franklin C. Tedder after his death in 2005. Contact Tedder & Sons Masonry for all of your masonry needs. We are fully insured. We work in the surrounding counties of Caldwell, Iredell, Catawba, Burke and of course our home town of Alexander County. Visit our website to view a slideshow of our work. 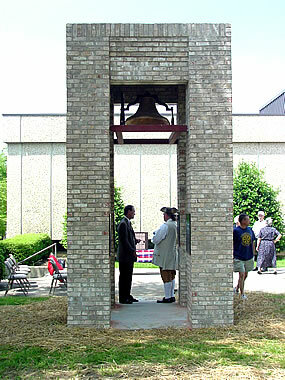 The Alexander County Veteran's Memorial Bell Tower located on the Courtyard grounds is one of Tedder & Sons' projects. The photo above was taken at the dedication ceremonies where there was a re-enactment by "Patrick Henry" played by Chuck Houchins. You can see that he is dressed in colonial attire as he stands in the view of the bell tower. Stop by to view this meaningful memorial and the quality work of Tedder & Sons Masonry who were honored to work on this project for Alexander County. From residential to commercial, Tedder and Sons Masonry is able to take care of all of your masonry needs. 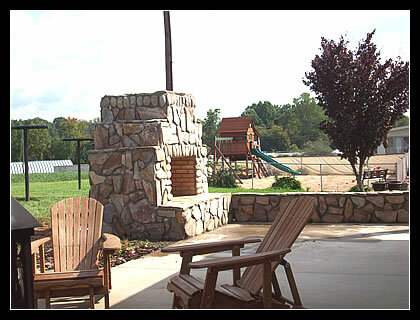 We do brick work & block work along with stone work as pictured in this photo of a custom outdoor fireplace. We are fully insured and serve Alexander and surrounding counties.